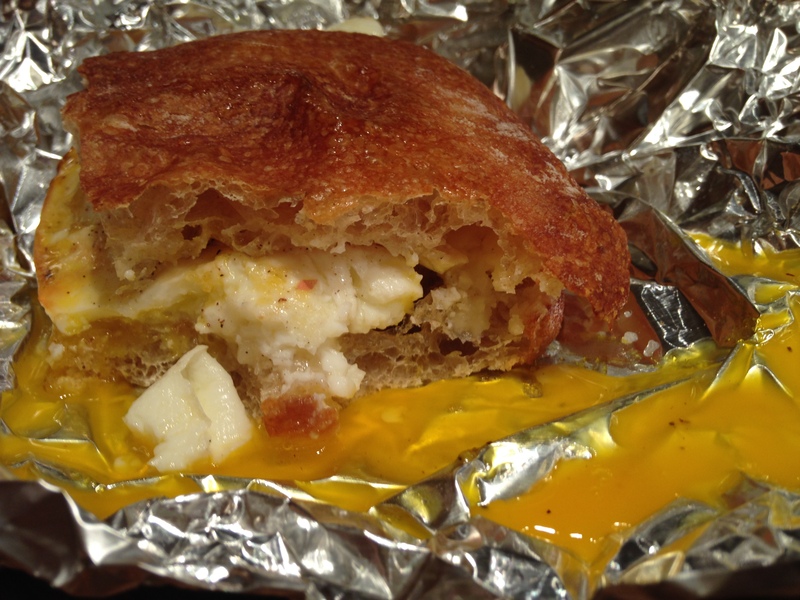 Prior to moving to New York City way back in 1996, I had never encountered egg and cheese on a roll. This dish is a staple of the New York deli–and an essential ingredient when you need to rally the morning after. I moved into my first roommate-free apartment in 2002. It was a charming mini-loft near the South Street Seaport. Feeling rather fabulous and grown, I decorated my apartment in high bachelor pad style and took up whiskey drinking. Consequently, I spent many a morning lolling about on my retro fabulous couch weighing my desire for an egg and cheese on a roll against my desire to never put on pants again. And then it dawned on me. Why not treat my aching head and gurgling gut in the comfort of my own home? It is the rare day that I do not have eggs, butter and some sort of cheese in the house. If I could just manage to pick up a bread product on the way home, I should be good to go. Fry an egg and stick it on a toasted roll with some cheese, right? Alas, this seemingly simple sandwich was not quite as straightforward as I thought. My early efforts yielded cold, hard cheese and bread that was crispy and scraped at the roof of my mouth. Over time I developed a few simple tweaks that helped things along. But the game changer came when I introduced aluminum foil. The key to that perfect deli version, I discovered, is wrapping your completed dish in foil for a few minutes. This allows the cheese to get a bit melty while the steam softens the roll, yielding a cohesive, gooey and delicious mess of a sandwich. Bring a large cast iron skillet up to medium-low heat. Swirl half a tablespoon of butter in the pan. Slice your roll in half and set cut-side down to one side of the skillet, pressing down a bit. Thinly slice an ounce of cheese of your choice. Crack an egg into the other half of your skillet. Tear off a square piece of aluminum foil. (Heavy duty is best.) Flip your roll and allow to toast on the other side. When your egg is mostly set, give it a quick flip to firm up the white. Place one half of the roll on the foil, layer with cheese, scoop the egg on top, add salt and pepper, top with the other half of your roll, and wrap tightly in foil. Allow to sit for a few minute while you get yourself another glass of water, which you probably should have been drinking the night before. While this dish is a godsend after a night of over-imbibing, I am here to attest that it is also a lovely way to reward yourself after skidding across icy sidewalks for a morning yoga class on a cold and rainy Sunday. This entry was posted in breakfast, vegetarian and tagged bread, cheese, eggs by Jasmine Nielsen. Bookmark the permalink.